Basler USB 3.0 cables are built for industrial environments. Rugged construction with additional shielding reduces radio frequencies and electro-magnetic interference. One end of this cable has a USB Micro-B screw-lock connector that, when attached to a Basler ace camera, is angled downward at 90 degrees. This keeps the installation compact. The other end has a standard USB Type-A connector. 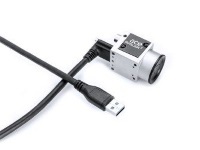 Recommended for use with USB3 Vision cameras. Shown in the image above with a Basler ace camera, which is sold separately.